Look at me! 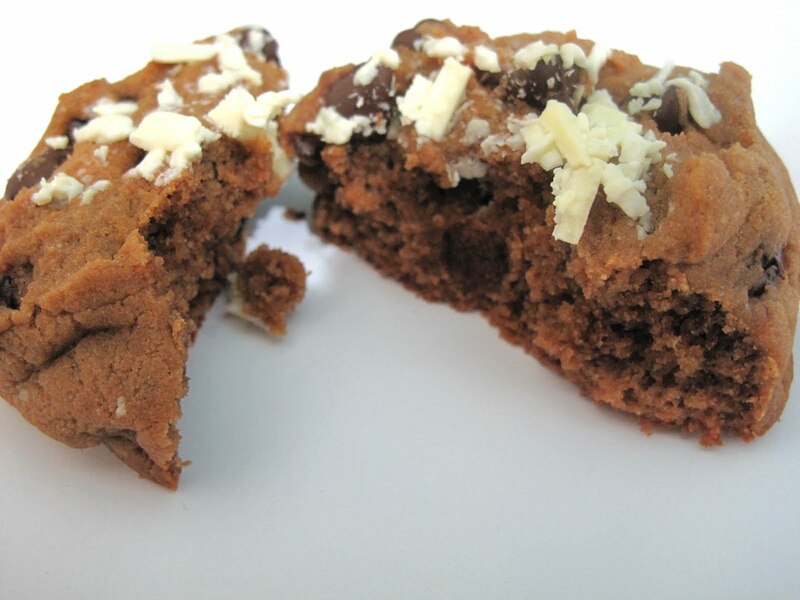 I'm the thickest, chewiest and yummiest chocolate chip cookie! My cooking and baking is at its best for a week after the exams. I take all the liberty to treat and pamper myself with all kinds of food. May be its because of how exhausted I feel after all the hard work (read: short cuts). But the truth is during the studying the breaks I take are dedicated to food gazing all over the blogsphere. It motivates me to get over with the exams as soon as possible so I can put my hand onto some fabulous recipes. I'm not a big fan of cookies but my husband is. Or may be I just avoid liking a cookie. Just like I usually avoid following a sweet blog on regular basis to keep myself sane and alive without carrying a guilty weight around. But I find no better time to do all the wrong things but during those study breaks. During one of the breaks I was going over the recipe by Browneyedbaker for what she called the thick and chewy chocolate chip cookie. Over the past 2 years I have had my share of chocolate chip cookie recipes which claimed to be the one! I did come across many good, average and bad recipes. But the web is full of cookie recipes and I don't believe in adding another one which is just about good. It should be special. And I think I have found the special recipe. Me not the cookie lover actually loved this cookies and don't even ask about my husband. He couldn't keep his hands off. Ahem! Off the cookies I meant! Preheat the oven to 165 C. Whisk together the flour, baking soda and salt. In a larger bowl, whisk the butter and sugar till well mixed. Add the egg, yolk and vanilla and combine. Add the dry ingredients to the wet, slowly incorporating and just till well combined. Mix the chips. Divide the ball into two with your hands and turn it 90 degrees. The uneven surface should now face upwards. Combine the two balls to form one ball again but the uneven surface should remain as it is. 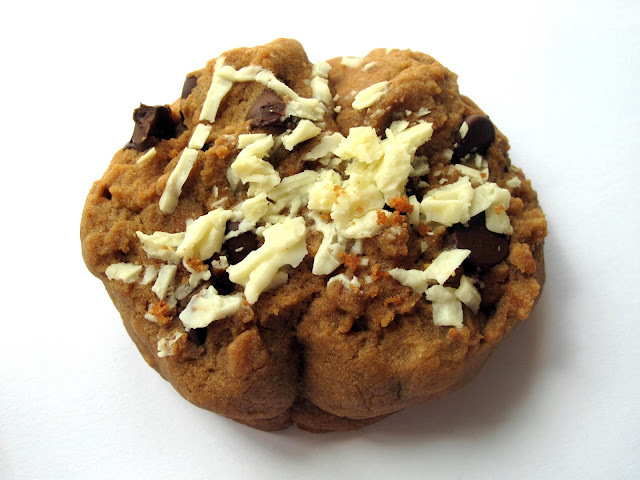 What we are looking for a is rustical bakery style cookie. And just when I was putting the cookies in the oven, I decided to top the cookies with some white chocolate shaving in the center. How can that not be good ? about 1/2 tbsp for each. Place on a baking sheet with 2.5 inch distance between each. I didn't find the need for the parchment paper but if you please, use it. Tuck it into a 165 C oven for 20 minutes or just till the cookie is set at the exteriors and is still soft and puffy in the interiors. Turn the cookie around once in the baking period. Indulge. 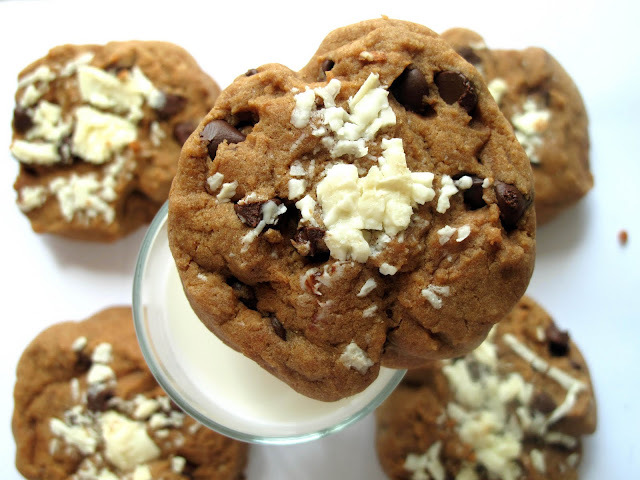 Thick and chewy cookie. Just like we like it. With snow like white chocolate shavings, it was a perfect balance of sweetness. Leaving you with one last picture. Stare! YUM!! This definitely looks thick and chewy!! Plus loaded with chocolate. You have great pictures too!! Love the white chocolate shaving idea. These cookies look delicious. 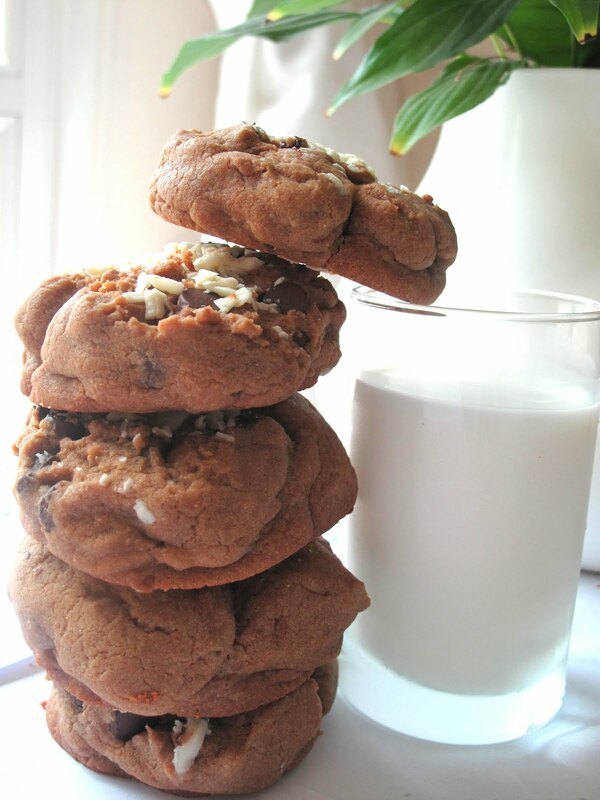 Thick and chewy chocolate chip cookies are my favorite-the chocolate shavings are a nice touch! Thanks for the recipe. These chunky cookies look delicious. I just love fresh cookies directly out of the oven. I tried these and they were delicious! But for some reason they spread out heaps during baking, and the dough was really soft and difficult to roll into a ball. Anonymous: I tried these and they were delicious! But for some reason they spread out heaps during baking, and the dough was really soft and difficult to roll into a ball. Hey Anonymous - There are couple of things which can make this cookie spread out so I'm stating them below. 1. First and foremost, make sure the melted butter is cool to touch before adding it to the sugar mixture. Warm butter will make the dough wetter and unmanageable. 2. If you roll the balls smaller, it tends to spread out more. 3. Also, if your grease your cookie pan with too much butter, the overall butter increase can lead to flatter cookies. I hope this helps. I'm so glad you tried them and found them delicious. I have been making these cookies forever. Hi I just came across this recipe, tried it, and loved it! Thank you for sharing, will definitely make again! I made these, my first batch were a bit puffy but my second were PERFECT, i think because this time i had refrigerated the dough overnight, meaning it was firmer, and easier to roll. as the butter in this recipe is melted i found it beneficial to chill the dough first, especially as the oven was preheated.